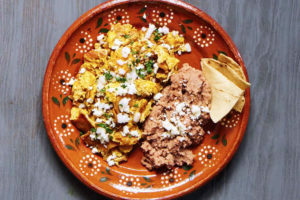 Are migas for breakfast or dinner? In my house, migas are for both. We have them for dinner once or twice a week and on weekend mornings. Never had migas? You should. 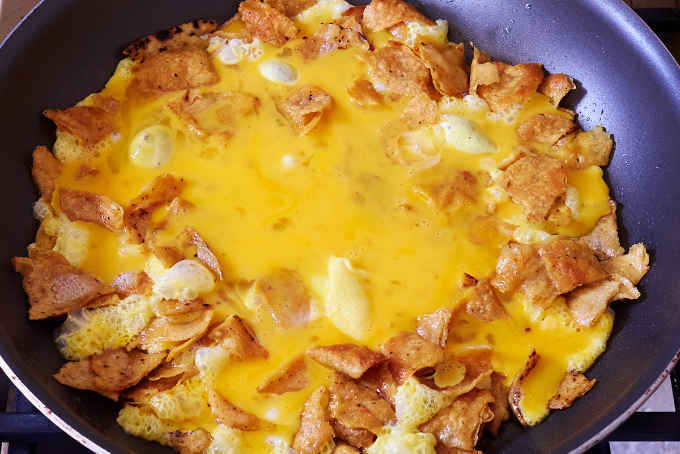 They are fried corn tortilla strips mixed with scrambled eggs and coated with your favorite salsa. I would call them a cousin of chilaquiles. 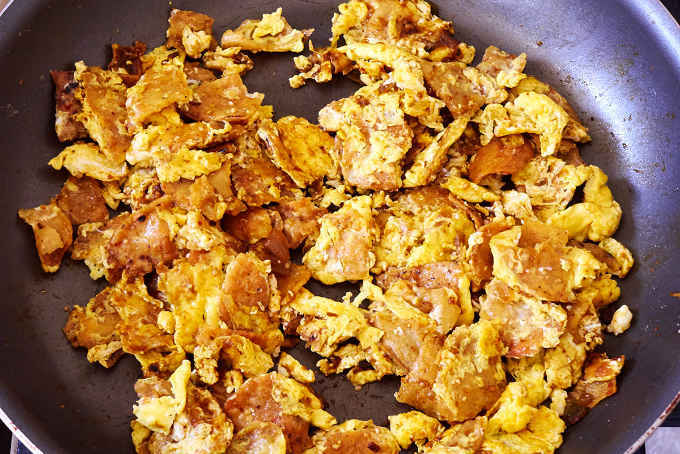 Migas are economical home cooking at its best where you use up every last bit of what you have on hand to create something delicious. You always have the ingredients: a few stale tortillas, some eggs, some salsa, a bit of crumbly cheese and a hunk of onion. 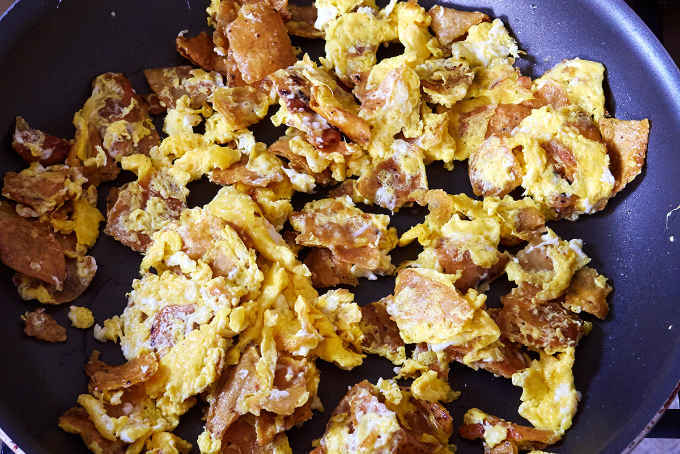 The name migas means “crumbs” or perhaps “scraps.” You wouldn’t think that “scraps” could be so tasty but they are. 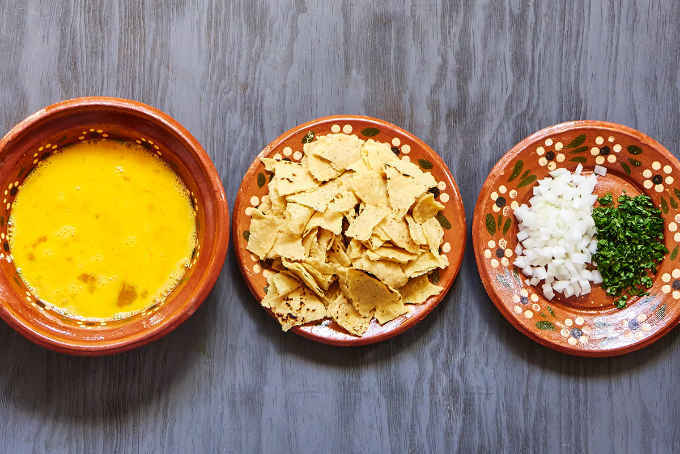 Mexican migas tend to be less elaborate than Tex-Mex style migas which may have diced tomato, bell peppers, avocado, Monterey Jack cheese, sour cream, and all kinds of other things. Tex-Mex migas are excellent but I prefer the simplicity of migas prepared Mexican style. 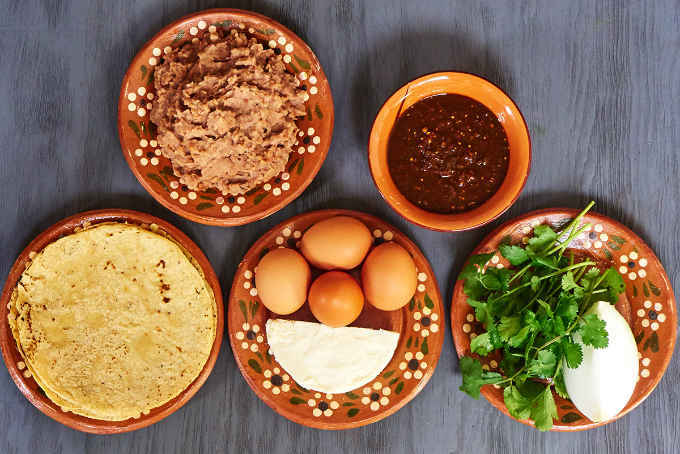 You will need 4 eggs, 4 corn tortillas, 1/2 cup salsa, 1/4 white onion, 8 sprigs of cilantro, 3 ounces ranchero cheese, 1 1/2 cups refried beans and a few corn chips. Beat the eggs, pull the tortillas into short strips and chop the onion and cilantro. Add the shredded tortillas to 3 tbsp. preheated oil. Cook stirring occasionally until the tortilla strips are golden and just reaching the point when the become crispy. Pour the beaten eggs into the pan and turn the heat to medium-low. Let the eggs set for 1 minute. Turn and break up the eggs. Continue cooking until the eggs are just set. Add 1/2 cup of your favorite salsa. You want enough salsa to coat the migas but not so much that the migas become soggy. Stir well until the migas are thoroughly coated with salsa and cook for 1 minute. Top your migas with crumbled ranchero cheese, chopped onion, and cilantro. Serve with refried beans and a few corn chips on the side. How do you like your migas? 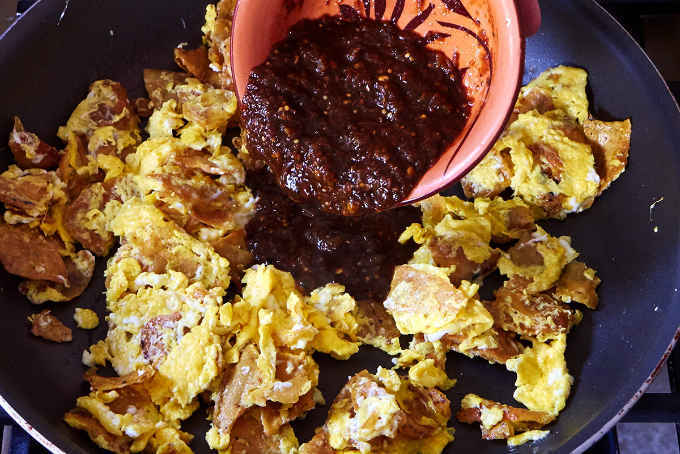 Migas - fried corn tortilla strips mixed with scrambled eggs and coated with salsa. Economical Mexican home cooking at its best where you use up every last bit of what you have on hand to create something delicious. Pour the beaten eggs into the pan. Add 1/2 cup of your favorite salsa. 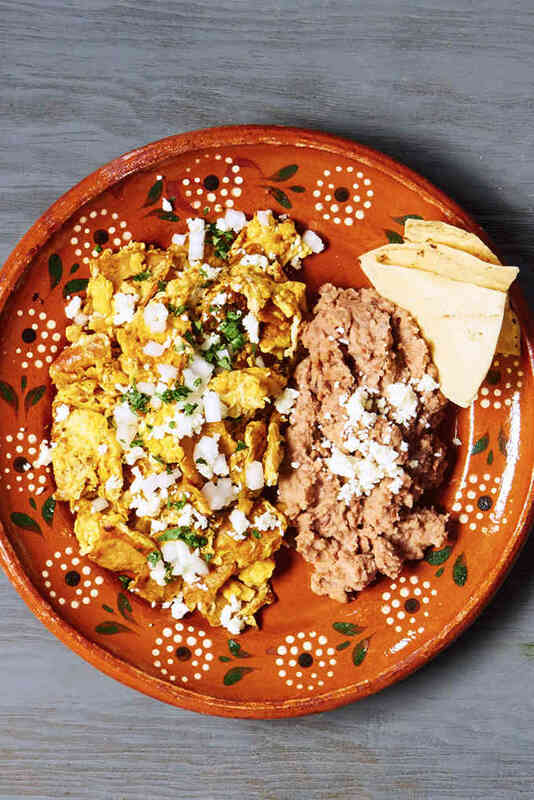 Top your migas with crumbled ranchero cheese, chopped onion and cilantro. Serve with refried beans and a few corn chips on the side. 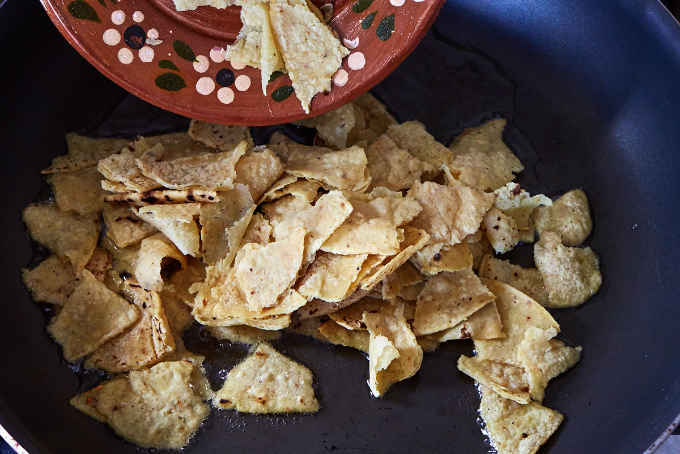 Stale tortillas make better migas. 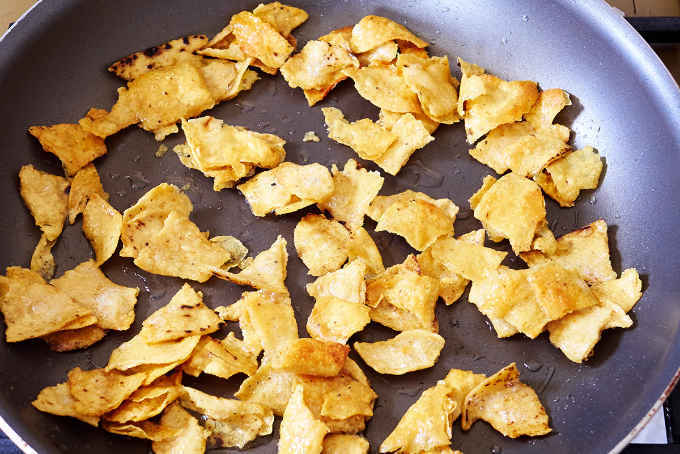 You can substitute tortilla chips for the fried tortillas. Yum! I love all of your photos of the processes. These remind me a little bit of estrujadas. My mother-in-law (who is from Poza Rica, Veracruz) makes them when I visit. Love Migas. I live in West Texas, so it’s usually Tex-Mex Migas for us here. Sounds delicious. My dad used to make us scrambled eggs for a Sunday breakfast which he would serve with salsa. He never used the tortillas but then, he was getting wild already being of Norwegian and Irish descent! He only learned to eat spicy or Mexican style food from my mother and her family. I also remember having a heated discussion but it was over the preparation of pinto beans. My family used a bit of salt pork with the beans for flavor but evidently that is a no-no in some parts of Mexico. Which way does your family cook the pintos? These migas sound wonderful. I would do it with salsa verde, because I prefer it to the red stuff. 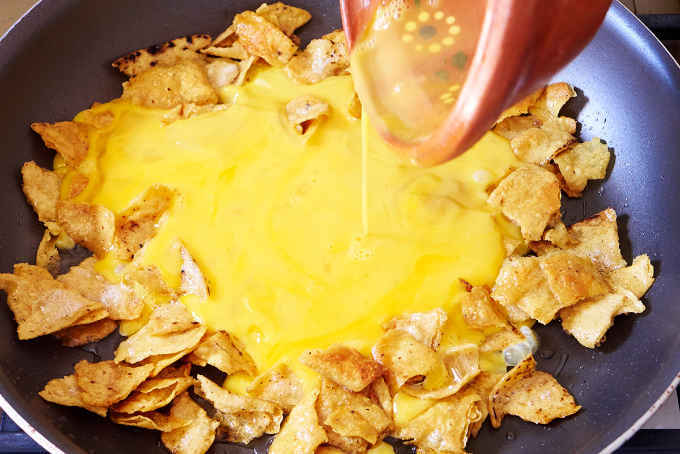 I live in Texas, on the border with Mexico, and would not consider making Tex-Mex style migas. The real Mexican thing would be much better. I think that is generally the case. This website has so many amazing recipes. It is now my go-to. I am a displaced Texan who needs authentic Mexican cuisine periodically in order to function properly, and I have found it here. This recipe is out of this world. Thank you! We totally understand what you mean when you say you can’t function with without Mexican food. It happens to us too :) That’s awesome that the migas recipe works for you and the Mexican Food Journal is your go-to site! Cheers!